…since I updated this blog. In early April my father died and much of April was spent in England helping my mother with various arrangements and fielding the mass of paperwork that appears in the wake of someone passing away. I’m not going to dwell on his passing here – he was in his 90th year and had had a very good life so it’s a family sadness but no tragedy – but it’s worth remembering him as he was a keen observer of wildlife, if in a somewhat sentimental way. Every fox in the local fields knew my parents’ address… and the fact there was always food for them at the edge of the field adjacent to the compost heap. He chatted to them as they fed a few metres from his feet. If a fledgling was in trouble, dad would be mashing up food to feed it. Sometimes they survived and off they flew. And at the other, less glamorous end of the wildlife spectrum, any unfortunate worm that got caught up in gravel and thrown into the cement mixer when he was constructing a path or a wall could be assured of a safe return, gently extracted and thoroughly rinsed, to a moist, shady patch of earth. He cared about the little things. RIP, Dad. But… spring has been progressing in my absence and things have been happening in the pond. There are some taddies swimming around in the surprisingly clear water but not in the quantities we saw last year. 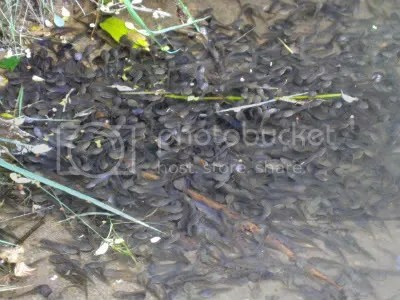 Last year there were “swarms” of tadpoles sunning themselves in the shallows. This year, despite vast quantities being laid in February, I can only assume that a lot got frosted and didn’t hatch. On the other hand, plenty of creatures consider tadpoles a tasty meal so perhaps they’ve been seriously predated this year. Last year we saw a great diving beetle larva which is a voracious predator of the innocent, unassuming tadpole (!) and we certainly have great diving beetles because here is a photo of a female taken yesterday. Distinguishing marks of a female is the furrowed wing case whereas the male is smooth and glossier. Look closely and you can see the bristles on the hind limbs – they help propel the beetle through the water and it does swim surprisingly quickly even though they store air under their wingcases to breathe while they’re underwater which means they have to fight natural buoyancy to stay underwater . 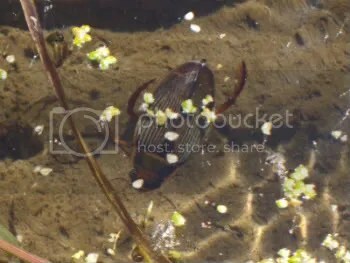 The adults are carnivorous too so tadpoles have to swim away sharpish if an adult diving beetle is on the hunt. Eggs are laid on plants in the water and on the margins, hatch into larva summer and the larvae pupate the following spring and become fully fledged beetles. We also have generous quantities of newts in and around the pond. I have no idea what types. I’m thinking that sometime soon I need to have a sweep through the margins of the pond with a net and see what I find. It’s going to be much easier to identify subjects when I can see them without the distortion of the water and take a few photographs for future analysis and (I hope) identification. I won’t need to have my collection out of the pond for long but it’s frustrating to see things scooting across the bottom of the pond and have no idea what I’m watching. In addition, it’s difficult to get good photos of underwater activity – especially with the reflections – no matter how clear the water is. 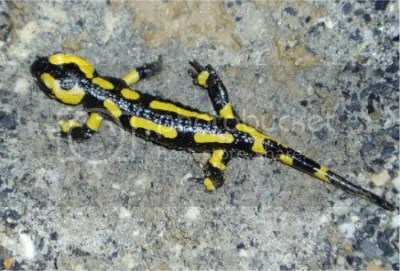 A few years ago, we did find a fire salamander ambling peacefully across the gravel. These are not present in the UK so that – combined with the fact they look like something imagined for a Doctor Who character with it’s stripes of fluorescent yellow – makes them a rather exciting find.